Lost amid important things like t-shirt slogans and a certain car exec's hairdo, we kind of missed the completion of the General's Lambda-platform trilogy. Rick Wagoner's blue-haired Buick brand has now allowed pricing on the Outlook Acadia Enclave to run free out of the Woods. The CX, the base-level FWD version of the Buick Enclave, will hit showroom floors at the jaw-dropping price of $32,790, with the AWD model of the base-level coming in at $34,790. Now if you want some options on that CUV, the de-luxe model, the CXL, will come in at a $34,990 with FWD and the AWD starting at $36,990. That's nearly $3,000 more than the Acadia, its Lambda-platformed cousin at GMC and nearly $5,000 more than its platform-prostitute cousin, the Saturn Outlook. Considering all three start off with the same 275-hp 3.6L VVT'ed V6 what could provide for the huge price discrepancy? Oh wait, here it is — a "Tiffany-style analog clock", a "leather-wrapped, genuine Mahogany wood steering wheel," and the ability to have Tiger Woods answer your calls to OnStar. Sweet. Gallery below and full press release after the jump. DETROIT - When the all-new 2008 Buick Enclave luxury crossover sport utility vehicle arrives in dealerships early this summer, it will come equipped with a long list of standard equipment, a suite of owner services and a price unmatched in the segment. The front-wheel-drive Enclave CX starts at $32,790, while the all-wheel-drive model starts at $34,790. The front-wheel-drive Enclave CXL begins at $34,990, while the all-wheel-drive version starts at $36,990. Prices include a $735 destination charge. "Enclave is a segment-busting luxury crossover that best defines the new face of Buick," said Steve Shannon, Buick general manager. "Its gorgeous design, high-tech features, functionality and roominess, coupled with a quiet and refined ride, put us in a great position to attract new customers." Buick's first luxury crossover SUV is equipped with a long list of standard equipment and technologies that are uncommon for vehicles at Enclave's introductory price. A new, 275-horsepower 3.6L V-6 powertrain featuring variable valve timing (VVT) powers the Enclave. The sophisticated dual-overhead camshaft engine is mated to Buick's first six-speed automatic transmission. Enclave offers a spacious cabin, with a standard seven-passenger seating configuration, second-row Smart Slide captain's chairs and a third-row seat that can accommodate three adults. With Smart Slide, occupants have quick and effortless access to Enclave's third row. GM engineered the Enclave to be the quietest crossover on the road. Buick's standard QuietTuning initiative, an engineering approach to reduce, block and absorb unwanted noise from entering the interior cabin, yields a library-quiet drive experience for all passengers whether they are seated in the front or third row. All Enclave models come equipped with six standard air bags, including dual-stage frontal air bags, roof rail head curtain air bags for all three seating rows, and thorax side air bags for first-row seats. Other standard safety features include four-wheel disc brakes with ABS, StabiliTrak electronic stability control system with rollover mitigation technology, tire pressure monitoring system and traction control. For added confidence and convenience, all Enclave models come standard with the industry's best coverage and a suite of owner services, including a four-year/50,000-mile vehicle warranty, a five-year/100,000-mile powertrain warranty, and OnStar with Turn-By-Turn voice-activated navigation and one-year Directions & Connections Plan. A host of innovative features adds to the Enclave's standout position, including an adjustable front-row center console armrest with multiple storage capabilities, an optional second-row center storage console that unfolds to contribute to a flat load floor when the seats are folded (available late summer), a large storage area with an integrated well behind the third row, and third-row seat bolsters for added comfort. The seat bolsters deflate when folded to allow a flat load floor. Optional equipment includes a second-row 60/40 split-folding bench seat for eight-passenger configuration, 18-inch machine-finish aluminum wheels on CX models and 19-inch chrome aluminum wheels on CXL models. A rear-seat DVD system, an in-dash voice activated navigation system with back-up camera; a large, power-operated sunroof with second-row skylight; a rear cargo net and shade; and a heavy-duty trailering package (up to 4,500 pounds maximum towing capacity) are available on all models. A Driver Confidence Package is also available on all models and includes rear parking assist, remote starting capability and heated windshield washer fluid. Enclave CXL buyers can select the Luxury Package, which adds articulating front headlamps, power tilt and telescoping steering wheel and power folding outside mirrors. Four optional audio and entertainment packages, eight exterior and three interior colors are also available. 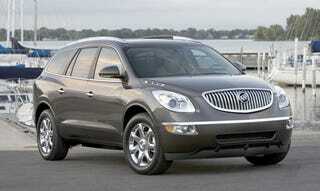 The 2008 Buick Enclave will be built at GM's new Lansing Delta Township assembly in Lansing, Mich.